What made these two companies withdraw from this hot market after less than six years of operation? The general perception of their failures is lack of adaptation to Chinese consumer culture. Are other reasons contributing to the failure of The Home Depot and Best Buy in China? The following discussion provides a deeper understanding of the factors challenging these companies to perform in China’s market. The experience of these two companies contrasts with other U.S. firms doing business in China. KFC and General Motors reported record sales in China at the same time and have higher profits in China than they have back home. 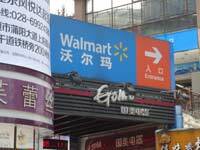 Another U.S. retail giant, Walmart, also has seen growth in its China sales. It operated 380 stores on the mainland by early 2013, becoming No. 2 in market share in China (Burkitt, 2013). With the rapidly increasing middle class and a housing boom, it should have been a very good time for The Home Depot and Best Buy to establish themselves in China, like other global brands. The majority of U.S. retailers are big-box stores, which means they provide a wide variety of products in a large physical space. A big-box retailer often uses a low price strategy to drive sales volume. The big-box retailer also has many stores across the country. Examples of famous U.S. big-box retailers are Walmart, Target, and Sears, as well as Best Buy and The Home Depot. The Home Depot is the world’s largest retailer of home improvement and construction products and services, headquartered in Atlanta, Georgia. Founded in 1978, The Home Depot created the “do-it-yourself” concept and changed consumers’ perspectives about how they could care for and improve their homes. Today, The Home Depot serves three primary customer groups: do-it-yourself (“DIY”) customers, do-it-for-me (“DIFM”) customers, and professional customers. The Home Depot has opened more than 2,200 locations throughout the United States (including Puerto Rico and the Virgin Islands), Canada, China, and Mexico. Stores average 105,000 square feet with approximately 23,000 additional square feet of outside garden area. Each store sells as many as 40,000 different kinds of building materials, home improvement supplies, appliances, and lawn and garden products for all kinds of projects (www.homedepot.com). Its primary rival, Lowe’s, currently has less than half of its market size. Headquartered in Richfield, Minnesota, Best Buy Co. incorporated in 1996 and specializes in consumer electronics. Today, Best Buy operates 1,150 stores around the world. Besides its big-box retail stores, the company also manages more than 100 Best Buy Express automated retail stores or “Zoom Shops,” operated by Zoom Systems, in airports and malls around the United States. Best Buy markets itself as having superior customer service provided by knowledgeable sales associates. Best Buy had its glory era: it was named “Company of the Year” by Forbes magazine in 2004, listed in the Top 10 of “America’s Most Generous Corporations” by Forbes magazine in 2005, and made Fortune magazine’s list of “Most Admired Companies” in 2006. After its rival Circuit City went bankrupt in March 2009, Best Buy became the largest electronics retailer in the eastern United States. For years, Best Buy has been reducing store space allotted for music CDs because of the surge of digital music access via Internet download. Today, online retailers, particularly Amazon.com, are seriously challenging Best Buy. E-retailers do not have the fixed costs of store space and employees, and therefore can often provide the same products for lower prices. Many customers often go to Best Buy stores to find products they like, but purchase them from online stores. In 2011, revenue and profits of Best Buy declined. In 2012, Best Buy announced a“”transformation strategy” to close 50 stores in the U.S. In early 2013, Best Buy announced a partnership with Samsung Electronics for a store-within-a-store concept to better utilize floor space. A strong 2012 Christmas sales season and the mini-mall strategy apparently gave investors confidence as Best Buy’s stock more than doubled in 2013 (Eule, 2013). As a result of successful economic development over the last three decades, China has become the most attractive and rapidly growing market for multinational companies. The size of the middle class, which has an appetite for spending, has been increasing rapidly. Meanwhile, China’s retail market is very fragmented with many small and medium-sized retailers. Cross-provincial retail stores are still rare because of local-access barriers that limit such growth. In 2008, the sector was composed of 549,000 small and medium-sized retailers, each with an average of 15 employees (Lu, 2010). For global big-box retailers, China appears to be easy territory to conquer with its abundant capital resources and global brand reputation. However, the retail industry in China has proven more complex than expected. Foreign retailers face various challenges from distinctive local consumer cultures to different industry practices in terms of the business model, marketing and sales practices, and supplier relationships. The Chinese retail industry has its own distinctive business model, which provides Chinese retailers cost advantages over their global competitors in their home market. Instead of running the retail business as a buyer and reseller as American retailers do, Chinese retailers are more like commercial property management companies. They own or rent the buildings, design the buildings as department stores or super markets, and rent out shelf space to individual manufacturers. Chinese retailers charge manufacturers space rent and commission from sales revenue. Manufacturers in the retail stores manage their own promotions, inventory, and operation to make sure they cover those costs, and make profits. Under such a business model, Chinese retailers do not worry about investment for inventory, operational costs to manage the products, or payroll to sales associates. However, foreign retailers are running their businesses in a completely different way. The foreign retailers are resellers. They decide the “best” product offerings for customers, select and purchase the products for resell, or contract suppliers to manufacture the products under their own brands. The foreign retailers not only commit large capital investments on inventory, but also carry the burdens of administration, marketing, sales, and service costs. The reselling model works in the U.S. because large retailers benefit from purchasing large quantities of products, managing retail prices to ensure their profit margins, and controlling the product quality level. However, this model causes challenges in China. The majority of retailers do not have the financial capability to hold a large inventory, nor do they have a mature retailing management system. Thus a “consignment” model gives them more flexibility to minimize burdens of holding inventories and managing products. Along with managing their own products for Chinese retailers, the manufacturers also arrange their own sales associates to manage sales in the retail stores. Trained by manufacturers and motivated by sales commissions, sales associates of Chinese retailers are more aggressive in promoting their represented brands and products. Unlike their Chinese competitors, the Western retailers hire their own sales associates, who often are not paid through sales commissions. Therefore, they might be less knowledgeable about the products and less motivated to interact with customers to drive sales. In the case of household products, Chinese retailers display products by brands. Each brand owns its own section in the store. For example, when a customer goes to the section of Hai’er, the most famous Chinese brand for home appliances, he or she will find all of the products offered by Hai’er in the same area. However, American retailers display products by product categories. It is common for American consumers to go to the same product category and compare products across brands. But for Chinese consumers, the depth of a product category offering can better represent the competitiveness of a brand. Displaying by brands is also preferred by suppliers as they can better present their brands by controlling the setup, more effectively run their sales promotions, and use fewer associates to manage the concentrated area. The typical marketing strategy also gives Chinese retailers advantages over Western retailers. Chinese retailers spend millions on advertising; however, the expenses are mainly paid by suppliers to promote their own brands and products. Western retailers focus on promoting their store brands and have to pay the majority of the advertising costs themselves. With a lower level of spending on advertising in general, Western retailers have trouble effectively leveraging their brand names in China. Suppliers to Chinese retailers have complete autonomy to manage their own products. Even though they carry the inventory cost, they do not carry the burden of late payment from retailers. Suppliers have more control over their promotions and prices. As long as they can pay the space rental and commissions to the retailers, it is a harmonious partnership. On the other hand, the Western retailers procure products from their suppliers and often decide the retail prices based on demand. Suppliers need to keep up all clauses of service agreements to guarantee order fulfillment, on-time delivery, and sales performance. Failure to meet service standards will result in financial penalties or loss of shelf space. Late payment is common, causing financial pressure on suppliers. Procurement management is not yet mature in China, thus communication between buyers and suppliers focuses on operational transactions with less emphasis on product development or marketing strategies. Suppliers are not able to effectively learn the needs of consumers through buyers for further product improvement. In order to improve sales performance, Western retailers often require suppliers to lower their prices to drive sales volume, and thus squeeze profits out of their suppliers. For suppliers, the required deep discounts ultimately make the retail stores the place to get rid of outdated and obsolete products. Bribing buyers also becomes part of the game so that suppliers can get a bigger volume or better shelf space. For all of these reasons, the relationship between suppliers and Western retailers is a challenging one. Because of the increased costs of doing business with the Western retailers, many small and medium-size suppliers choose to terminate the supplier relationship. Consequently, there are fewer brand selections in Western retail stores. 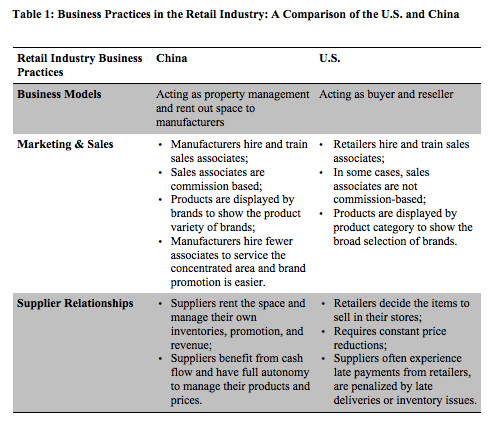 There are significant differences between Western and Chinese structure and practices in the retail industry (See Table 1). The differences seem to give Chinese retailers competitive advantages while challenging foreign retailers to penetrate the Chinese market effectively. In addition, the unique Chinese consumption culture poses extra barriers for foreign retailers. The following sections will discuss these issues as they apply to The Home Depot and Best Buy. In the last decade, the housing market in China has experienced annual double-digit growth. Unlike in the West, most new homes are sold in China as empty frameworks with only concrete walls. Homeowners need to invest significantly to finish the home, from flooring, ceiling, windows, bathroom fixtures, kitchen cabinetx, to doorbells. Very often the homeowners will select the design and materials they like and hire contractors to do the work. The new homeowners or the contractors will visit the traditional home improvement markets, which are often located in giant warehouses close to expressways. In these markets, dozens of manufacturers show their products for each category, such as tiles, toilets, bathtubs, etc. Customers can bargain over prices with the sellers and cut deals. After the transactions, sellers are responsible for delivering the goods. The home improvement business in China is still underdeveloped. With millions of new homes sold every year, China should be the best investment destination for The Home Depot with its expertise in home construction/improvement and high quality installation services. When Chuck Elias, The Home Depot’s China head, started investigating the market opportunity in China in 2005, he visited 25 cities, scouting competitors’ outlets and traditional markets. As he observed, “China is an incredibly exciting opportunity.” China became the top priority for The Home Depot to grow its business and to increase its stock price (Businessweek, 2006). The Home Depot started its journey in China in December 2006 through an acquisition of the Chinese home improvement retailer The Home Way. The Home Depot was able to establish its presentence in China quickly with 12 stores in six cities. However, the performance of the stores did not meet expectations, even amid China’s housing boom. By April 2011, The Home Depot had closed its last Beijing store, the fifth one in China, which left seven stores in Tianjin, Xi’an, and Zhenzhou. The Home Depot shook up its strategy by focusing on specialty stores in Tianjin to cater to specific needs and shopping preferences of Chinese consumers. It opened one paint and flooring store and one home decorations outlet, and planned to launch online operations with a Chinese partner. Later, in September 2012, The Home Depot decided to close all remaining big-box stores in China. There are various reasons for The Home Depot’s unsatisfactory performance, including the change in company presidents three times in four years, a dispute with a commercial property landlord, and poor supplier relationships. But the most common criticism focuses on the unique DIY business model. Many believe the failure of The Home Depot in China is mainly because Chinese consumers do not have the same “do-it-yourself” attitude as people in the U.S. Hiring home improvement contractors is very convenient and inexpensive. Chinese consumers do not have time or know-how to improve their homes on their own. The Home Depot admitted it misread China’s appetite for do-it-yourself products. With its announcement of the stores closing in China, a Home Depot spokeswoman said: “The market trend says this is more of a do-it-for-me culture”(Burkitt, 2012). Another interesting cultural issue is the signature orange apron worn by The Home Depot sales associates. In the U.S., the apron signals expertise and knowledge of home improvement. In China, a man wearing an apron is often looked down upon as someone who lacks authority. Therefore, customers in China did not feel they should ask for suggestions from people wearing aprons. In the U.S., The Home Depot is proud of its services and the knowledge of its sales associates who provide guidance to customers for home improvement projects. The company also provides installation services in the U.S., fulfilled by third-party service providers. In fact, many American families prefer to use installation services for complex projects such as flooring and roofing, rather than trying to do it themselves. So the “do-it-yourself” model might not be the only factor in The Home Depot’s failure in China. The product offerings suggest another problem. Products were perceived to be too cheap and simple. A longtime Chinese tile saleswoman says, “It’s mainly for poor people” (Grgurich, 2012). Chinese families like to decorate their new homes with high quality products. Chinese consumers are used to finding bargains from hundreds of suppliers at traditional home improvement markets, so shopping in a home improvement retailer is a new concept. The Home Depot was not successful in promoting and leveraging its global brand as the world’s largest retailer of home improvement. Many Chinese consumers are not even aware of the brand. Meanwhile, The Home Depot’s major competitor in China, B&Q, a subsidiary of Europe’s do-it-yourself giant Kingfisher, set the example of adaptation to local consumer culture. In Shanghai since 1999, B&Q stumbled through some rocky first steps, and then developed strong brand awareness through offering innovative services for customers. B&Q provides customers full design and decorating services from floor to ceiling to help customers transform their new houses from empty concrete shells into stylish homes at a reasonable cost. With this full-service strategy B&Q is the market leader in China with 39 stores, and is one of the largest Western retailers in the country as of 2013. In 2003, Best Buy dipped its toes in the Chinese marketplace by establishing its office in Shanghai. In 2006, after three years of research, Best Buy acquired a majority interest in China’s fourth-largest appliance chain, Jiangsu Five Star Appliance Co., Ltd., obtaining 136 stores in eight of China’s 24 provinces (Jiang, 2006). In January 2007, Best Buy opened its first flagship store in Shanghai with great fanfare. However, Best Buy also faced tremendous challenges. In the first five years of market entry, Best Buy expanded very slowly. By 2011, when Best Buy announced its store closings in China, only nine stores had been opened, six of them in Shanghai. With the increased disposable income among Chinese consumers, Best Buy should have appealed to the high-end middle class consumers. According to retail analyst Paul French of the Shanghai-based firm Access Asia, Best Buy offered “a concept ahead of the consumer.” Unlike their top Chinese competitors, Gome and Suning, which used the warehouse style of Chinese electronic chains, Best Buy moved the U.S. business model completely to China and built large, high-end flagship stores. These stores did not use glass cases. Instead, customers could touch and examine products without having to ask permission from staff. Products were displayed by different quality standards: “good, better, best.” Instead of aggressive and pushy vendors’ representatives, well-trained sales associates who did not earn sales commissions helped customers when they needed it. The associates were there to provide expert introduction to the products so customers could make their own purchasing decisions. Best Buy provided a much nicer shopping environment at prices no higher than its competitors (MacLeod, 2011). However, Best Buy apparently fell well short of its goals and did not flourish with this “customer-focused” business model in China. With only one percent market share after six years of operation in China, Best Buy decided to close its nine stores at the end of 2011. Many reasons are suggested for the failure of Best Buy. One of the most commonly heard is that Chinese consumers are “too cheap” to buy expensive products or to care about service, and prefer bargaining for discounts rather than choosing from set prices in these stores (Rein, 2011). Compared with its Chinese competitors, Best Buy spent more on store decoration and employee benefits, and had only a few stores. As a result, Best Buy had a much higher cost structure compared to its competitors, which may have led to higher prices for some products. In addition, except for a few Chinese brands, the majority of products in Best Buy were foreign brands, leaving consumers with fewer options. Although many enjoyed the shopping environment in Best Buy, consumers were also disappointed to see very few discounts in the stores, compared to the ubiquitous promotions in Chinese electronic chains. With few choices and not many special deals, Best Buy was perceived to be more expensive to Chinese consumers. While Best Buy selected the best of every product for their customers, Chinese consumers preferred to choose for themselves from hundreds of options. Kal Patel, head of Best Buy’s Asia operations, stated: “What we learned, very crucially, is that in China you cannot make revolutionary change. You have to work at the pace of the Chinese consumer” (Roane, 2011). Emphasizing large flagship stores could be another mistake Best Buy made. The four-story store in the Xu Jia Hui area of Shanghai’s premier shopping district is the largest Best Buy in the world. However, unlike American consumers who often drive to shop at the big-box stores, most Chinese consumers prefer to shop closer to home. With its slow pace of store expansion, Best Buy was unlikely to stand against fierce competition from Gome and Suning, both of which owned more than 1,000 stores nationwide (Ni, 2011). Ironically, the “cheap” consumers and flagship stores were not completely to blame either. Gome and Sunning did not hesitate to duplicate Best Buy’s business model, operation and marketing strategies, and even store decoration. Gome used blue as its store color, which some consumers confused with the blue logos of Best Buy. Gome also adopted the sales strategy to provide fixed prices and non-commissioned salespeople in some stores in 2010. As a result, sales soared because wealthier consumers were afraid of over-paying and prefer not to waste time negotiating (Rein, 2011). Both The Home Depot and Best Buy closed their big-box retail stores in China suddenly with no advance notice. Consumers and employees found announcements of permanent closure and locked doors when they came to the stores to shop or work. The sudden closures left many angry customers who had bought products with warranties and services, frustrated employees who received no sign of losing their jobs and worried suppliers who were still waiting for payments. All they could do was to work with support centers to deal with any refunds or payments. Actually, neither The Home Depot nor Best Buy planned to completely leave the Chinese market. Both companies planned to shape up their strategies in China by focusing on specialty stores and online sales. As previously mentioned, The Home Depot opened several paint and flooring stores and one home decorations outlet in the northern port city of Tianjin. Best Buy has continued to work with its Chinese subsidiary, Jiangsu Five Star Ltd., to open more electronic stores and is testing a Best Buy mobile store-within-a-store concept in some Five Star stores (Lee, 2013). Both companies are trying to cater to specific needs and shopping preferences of Chinese consumers. While U.S. big-box retailers prepare to shrink to smaller stores and focus on special products in China, one of their Chinese counterparts, Suning Appliance, China’s largest appliance retailer, plans to create superstores over the next three years, adding daily necessities and books to 400 existing outlets (Burkitt, 2012). Clearly The Home Depot and Best Buy will continue to face challenges from local and global competitors, and will need to be creative to respond to the different Chinese retailing practices and consumer culture. What can we learn from the cases of The Home Depot and Best Buy in China? The retail market in China is complex. Both these companies took cautious steps when they entered China. (See table 2 for a summary of the comparisons.) They conducted detailed market research, but apparently still failed to customize their business models to fit the market. They entered the market through acquiring previously successful Chinese stores, but were not able to fully leverage the acquired knowledge and experience. Both retailers faced tremendous challenges as a result of the different consumer culture, from major ones such as the consumption habits to minor ones such as the different perception of The Home Depot’s signature orange apron (Mei, 2013). In addition, Chinese retailers are more flexible and cost-effective than foreign competitors with their unique practices. Both The Home Depot and Best Buy failed to provide an education about premium Western brands. Neither retailer provided consumers superior value from a price advantage or sufficient product differentiation. The Home Depot’s products were too cheap and simple, while Best Buy’s offerings were too limited. As foreign brands are not very familiar to Chinese consumers, The Home Depot and Best Buy also faced tremendous challenges from distinctive industry practices that were not compatible with the norms for these companies. Nonetheless, with strong corporate leadership and a vision of long-term development in China, these challenges could be overcome. Burkitt, L. (2012). Home Depot Learns Chinese Prefer ‘Do-It-for-Me’. http://online.wsj.com/article/SB10000872396390444433504577651072911154602.html. Burkitt, L. (2013). Wal-Mart Says China Growth Is on Target. http://online.wsj.com/article/SB10001424127887324883604578396090449466504.html. Busienssweek. (2006). Home Depot: One Foot in China. http://www.businessweek.com/stories/2006-04-30/home-depot-one-foot-in-china. Deloitte. (2011). China power of retailing. Eule, A. (2013). All of a Sudden, Investors Love Best Buy. But Do Shoppers? http://online.barrons.com/article/SB50001424052748704235404578404641758715174.html – articleTabs_article%3D1. Grgurich, J. (2012). Why China Doesn’t Like Barbie, Best Buy or DIY. http://www.dailyfinance.com/2012/06/20/why-china-doesnt-like-barbie-best-buy-or-diy/. Jiang, J. (2006). Best Buy Acquires China’s Five Star for $180 Mln. http://www.bloomberg.com/apps/news?pid=newsarchive&sid=aXdoCwlUZ2R8&refer=asia. Lee, T. (2013). Best Buy Hires New CEO for its China Business. http://www.startribune.com/business/206772421.html. Lu, S. (2010). Understanding China’s Retail Market. http://www.chinabusinessreview.com/understanding-chinas-retail-market/. MacLeod, C. (2011). Best Buy, Home Depot Find China Market a Tough Sell. http://usatoday30.usatoday.com/money/industries/retail/2011-02-23-bestbuy23_ST_N.htm. Mei, G. (2013). 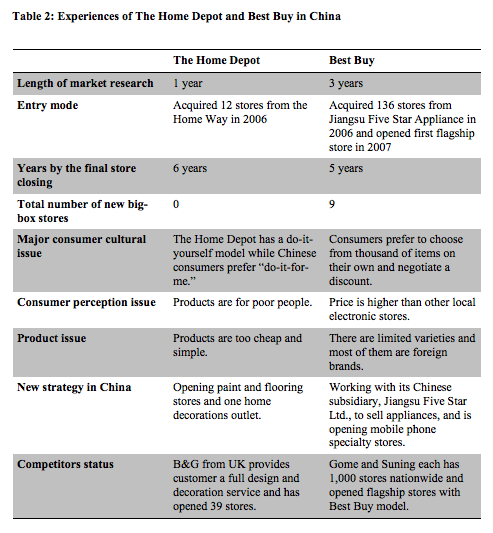 Culture Determines Business Model: Analyzing Home Depot’s Failure Case in China for International Retailers from a Communication Perspective. Thunderbird International Business Review, 55(2), 173-191. Ni, V. (2011). Best Buy’s Withdrawal: American Morals Fail to Transcend Chinese Consumer Market. http://www.china-briefing.com/news/2011/03/02/best-buys-withdrawal-american-morals-fail-to-transcend-chinese-consumer-market.html – sthash.48ndz7g4.dpuf. Rein, S. (2011). Why Best Buy Failed in China. http://www.cnbc.com/id/41882157/Why_Best_Buy_Failed_in_China. Roane, K. R. (2011). Best Buy’s Lesson from China: Cluttered Beats Curated. http://money.cnn.com/2011/02/10/news/international/bestbuy_china_fivestar.fortune/index.htm. Jing Betty Feng is finishing her Ph.D. in international business at Georgia State University, Atlanta, Georgia. She can be reached at bettyjfeng@gmail.com.